Dear Dr Seuss fans, a new treasure has been dug up, dusted off and reproduced for your enjoyment! What Pet Should I Get? was recently rediscovered by the widow of the man behind Dr. Seuss, Theodor Geisel. So far it has only been published in the U.S. where it’s been flying off the shelves and is currently sitting at #2 on Amazon.com’s Best Sellers chart. Non-U.S. fans, have no fear. You can order it via BookDespository.com. Geisel is one of the world’s bestselling children’s authors of all time having penned over 50 Seuss books, selling 200m copies in more than a dozen languages. What Pet Should I Get? is the seventh title to be published posthumously. 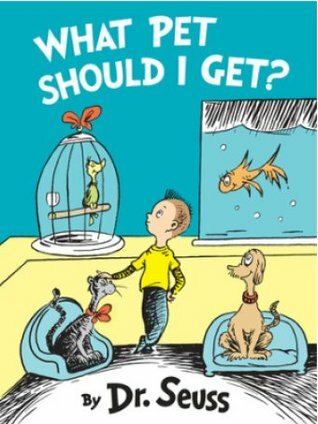 Unlike with Harper Lee’s heretofore forgotten manuscript, Seuss fans seem to be enjoying this newly available work. Does this mean that it’ll be a shoe-in when awards’ time rolls around? Perhaps another movie adaption is in the offing? No, no, no, please, no movie-izing another Seuss book. I’ve not seen any of the adaptions. Then again, I’ve never read a Seuss book.